What is the Price-Weighted Index? 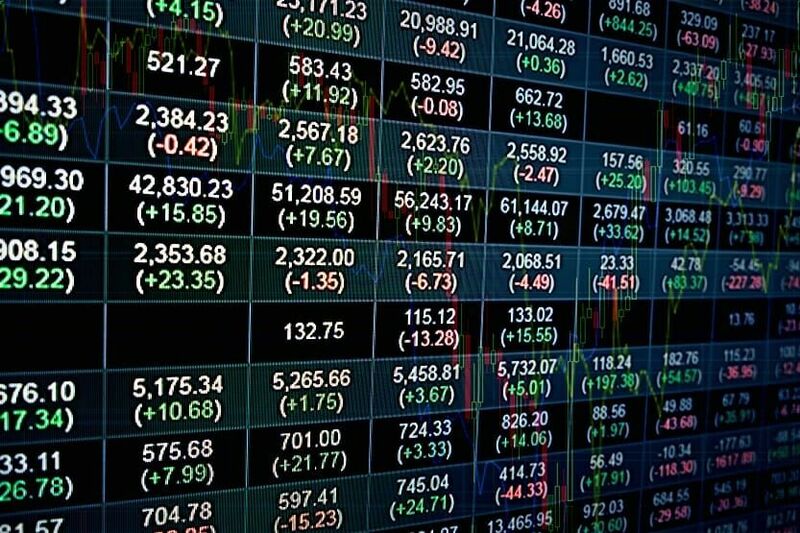 A price-weighted index is a type of stock market index in which each component of the index is weighted according to its current share price. 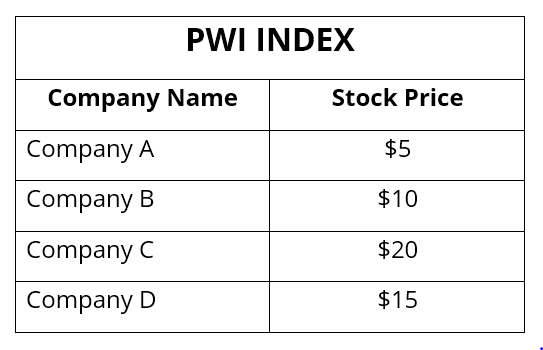 In price-weighted indices, companies with a high share price have a greater weight than those with a low share price. Therefore, the price movements of companies with the highest share price have the largest impact on the value of the index. Nowadays, price-weighted indices are less common than other indices. Instead, the capitalization-weighted index is the most prevalent form of market indices. The biggest price-weighted indices are the US Dow Jones Industrial Average (DJIA)Dow Jones Industrial Average (DJIA)The Dow Jones Industrial Average (DJIA), also commonly referred to as "the Dow Jones” or simply "the Dow", is one of the most popular and widely-recognized stock market indices and Japan’s Nikkei 225Nikkei IndexThe Nikkei Index, or Nikkei 225, is the most recognized Japanese stock market index. It comprises Japan's top 225 companies listed on the Tokyo Exchange..
A price-weighted index is often criticized because it considers only the price of each component as the driver of the index value. Therefore, even a small price fluctuation in a higher priced company may significantly affect the value of the index. 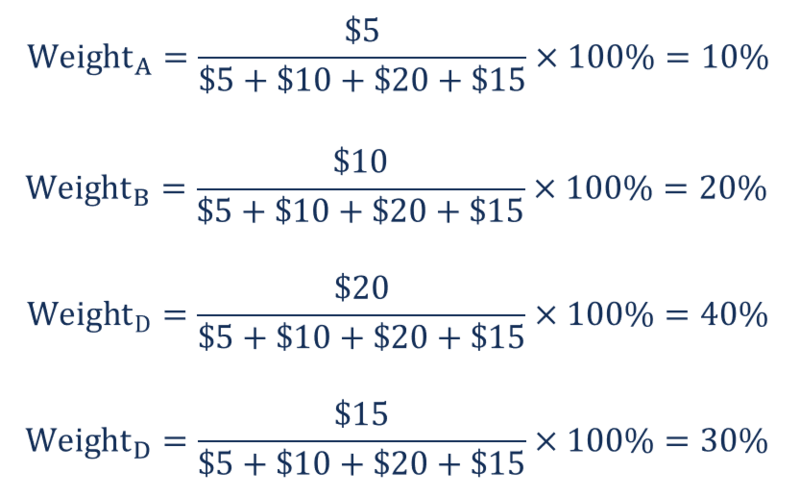 In theory, the value of the index can be determined as an arithmetic average by dividing the total sum of the prices of the components in the index by the number of the index components. However, such an approach is not usually encouraged because events such as spinoffs, stock splits, and mergersTypes of MergersA merger refers to an agreement in which two companies join together to form one company. In other words, a merger is the combination of two companies into a single legal entity. In this article, we will look at different types of mergers that companies can undergo. Types of Mergers There are five different types of affect the composition of the index. In reality, the value of a price-weighted index is calculated by dividing the total sum of the prices of the index components by the divisor. The divisor is an arbitrary value computed by the index and adjusted for various structural changes in the index components. For example, the Dow Jones Industrial Average, which is the most prominent price-weighted index, calculates its own divisor (Dow divisor). The Dow divisor changes over time to better match the existing composition of the index.